Now you can try these on right now. 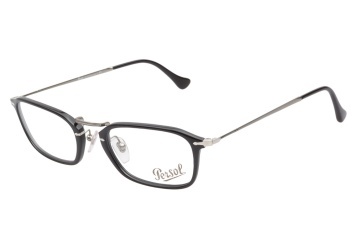 Measurements Lens Width: 52mm Lens Height: 33mm Bridge Width: 21mm Arm Length: 140mm Frame Width: 142mm Details Persol 3044V 95 Black Gender: Female Manufacturer: Persol Material: Acetate Color: Black Polarized: No Progressive Eligible: Yes Persol PO3044V 95 Black eyeglasses are distinguishably eclectic. This vintage inspired style features glossy black acetate rims surrounding softened rectangular shaped lenses and connected by a matte silver metal bridge. The ultra-thin temples are flexible and lightweight, finished with acetate tips.